I have visited the Hofbräuhaus twice in the past 2 months, which is quite unusual for me. I wouldn't normally visit the same restaurant so frequently - unless dirt cheap or conveniently located next to uni, home or work. Perhaps it's my new-found love for all things German, nostalgia for my all-too-brief visit to Berlin last year (photos here and here), or just the fact that I'm greedy as anything and the Hofbräuhaus does serious portions. And seriously delicious portions. It is a really fun place. Think - unselfconsciously kitsch decor, including posters of German landmarks, beer steins, live musicians wearing lederhosen, and beer available by the litre. I think they do a lot of parties on the weekends. Weekdays tend to be quieter, with a large number of solo diners. 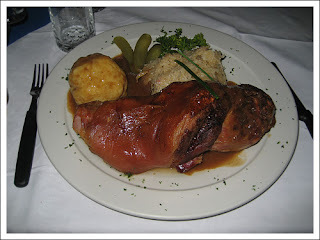 The first time I went, it was in a group of 8 friends, and I attempted to conquer their speciality - Münchner Schweinshaxe mit Sauerkraut und Kartoffelknödel (photo at the top of this post). It was delicious; a juicily tender pork shank with a pile of sauerkraut and a fluffy potato dumpling. Sadly, I only got through about a third of it before I admitted defeat. The second time I went, with my family, I spotted a solo gentleman diner (the type who could only be described as a "well 'ard geezer") sitting down to the massive Schweinshaxe and a litre of beer. And finishing it! Sir, I salute you! The mains run from $25 to about $30, and you get a lot of food for that price. Why have the schnitzel for $26.90, when for a mere $3 more, you can get the GIANT schnitzel! Debreciner with sauerkraut and fries. Salmon, made gluten free. Most of the menu items can be made gluten free, just ask the waitstaff. Jägerschnitzel - crumbed veal cutlets with a creamy mushroom sauce, vegetables and Spätzle. German Sandra says: The Jägerschnitzel does taste like home. Chicken schnitzel with real mashed potatoes (none of that Deb crap, thank-you!) and house-made mayo. Rindsroulade - beef wrapped around a mixture of mustard, cornichons and bacon. 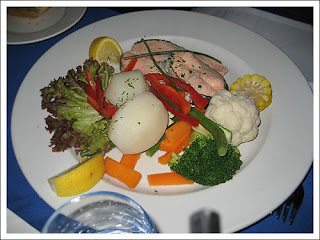 Mum says: I liked my rindsroulade, but I wouldn't have minded having that goulash! If you have room for dessert, the offerings run from the standard black forest cake to cheesecake, to strudel, to cottage-cheese dumplings. At $11.90 each, I think they're a bit overpriced, but are OK to share. Apfelstrudel. Unusually served with mango ice-cream instead of vanilla but still good! Štrukli. I think these are actually Croatian or Eastern-European in origian rather than uncompromisingly German. It is a dumpling filled with cottage cheese and flavoured with tarragon leaves. We had a great time, eating, drinking, and listening to the band. We left happy - full of yummy food and lots of beer. If you're not drinking, try the non-alcoholic malzbier. It's really tasty. Mmm... extra malty! On our way out, we noticed some beer steins which were "Free to good home - slightly damaged". This impressed my brother greatly. Daniel: Woah! Free glasses! This place ROCKS! You ate all that food? Mmmmmm... tasty German goodness. And all with sieable portions! I gotta get there and fast!! Unlike my experience at Longrain last weekend, I'm sure I'll love it! Yes, Hofbrauhaus has been there forever. I haven't been for about twenty years. 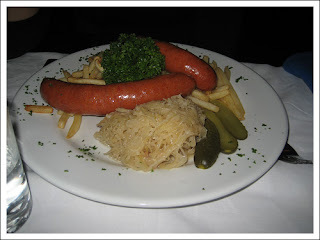 Must visit again, I love German food. And beer. Wunderbar! Meat. Check. Potatoes. Check. Beer. Check. What more could you ask for? Oh yeah, kuchen! Yum! It looks soooo good. You guys had a total chowdown fest. Good going.